Northway, Canada's oldest summer camp for girls, founded in 1906, is located on a beautiful peninsula inside Algonquin Park. We offer a traditional program based on our wilderness setting of swimming, sailing, canoeing, kayaking, arts & crafts, nature, dramatics and canoe trips. Northway has developed an unmatched style, spirit and skill in canoe-tripping. Wendigo is a small canoe-tripping outpost offering canoe trips for older boys (12-16) throughout Algonquin. Campers are involved in every facet of the trip. They learn the value of efficiency and ingenuity in setting up camp and living outdoors. Boys learn teamwork and leadership. We offer 13-day, 3 ½-week and 7-week sessions, and 1 week sessions for girls 7-9. 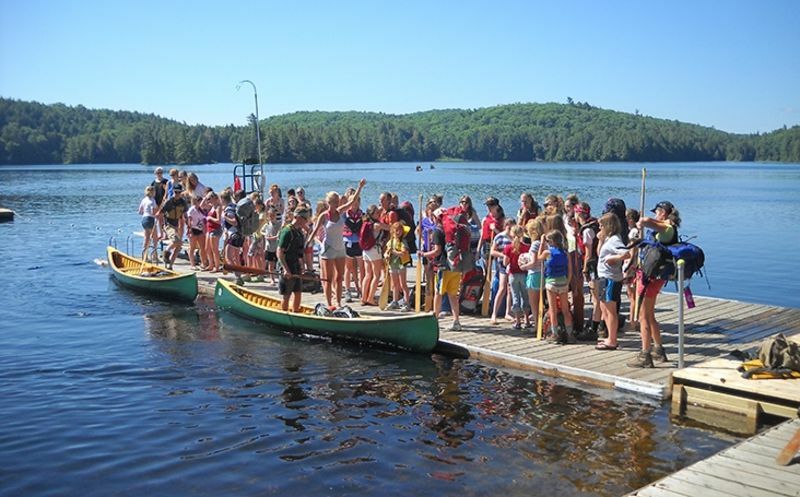 Northway is the oldest girls camp in Canada, having been founded in 1906, and so much of the camp’s charm comes from the long-standing traditions and the approach. It’s hard to imagine a more traditional camp than this: paper and envelopes are listed in what to bring, and campers really do write real letters home. iPods, jewelry, cell phones, and valuables aren’t allowed. When campers arrive, they are really here, immersed in all the priorities of the camp: spending time together, singing together, and experiencing something different. It’s not a time capsule, but rather a place that has stayed absolutely true to the ideals that it was formed around. And it’s as charming, and charmingly beautiful, as any summer camp you could ever hope to find. The programming is strong and varied, though the experience of place is the focus. The campers stay in canvas, cabin-style tents, and they spend their time doing the most traditional activities: canoeing, sailing, tripping, reading, making crafts. The current director, Brookes Prewitt, came as a child in 1951 because his mother was camp director, and he’s been at Northway literally every summer since. That’s a run of 66 years. His mother was director for 26 years prior to him. Wilson, Brookes’ son, first came to camp when he was three months old, and he’s been there every summer since, taking various leadership roles along the way. That’s pretty great too. Girls who have attended Northway know that they’ve participated in something quietly unique, which is an experience which unites them, even much later in life. During Northway’s 110-plus years we have remained committed to our small size of just 51 girls. Each camper is an important part of camp life. Lasting friendships form where girls have the opportunity to spend time together in the absence of today’s constant exposure to technology. Our wish for girls to live in and appreciate the beauty of nature is accomplished at our extraordinary location in Algonquin Provincial Park. Algonquin provides an ideal location for our small, two-canoe, 6-person out-trips. With a large staff presence, girls are able to gain confidence, independence, a sense of community and wilderness skills that will last them a lifetime. Wendigo provides a unique opportunity for older boys interested in canoe tripping to spend their time in a small group setting exploring Algonquin Park. Wendigo emphasizes teamwork, canoeing skills, self-confidence and creating a connection with our natural, wilderness environment. We look forward to welcoming your child to our Algonquin summer home. On the last night of camp, Camp Birthday celebrates another wonderful summer at Northway. Campers and staff enter the dining hall under an archway of paddles decorated and held by the Wee Woodsmen. A special dinner that includes birthday cake and ice cream is followed by singing, awards, and skits. The evening ends around the campfire with a gift exchange. Names are drawn (but kept top secret! ), and gifts are made with items available at camp--from the craft house and the forest's natural media. Our talented counsellors produce 2 full musicals each summer. Impromptu playlets, one-act plays and skits are also a part of the drama program. The girls use their creativity to decorate the outdoor amphitheatre for the many plays. Alice in Wonderland, complete with dancing lobsters, was one of our most popular plays. In the past, other plays have included Annie, Grease, The King and I, My Fair Lady, Oliver, and The Wizard of Oz. Canoe trips are the most special and loved of all activities. Over the decades that campers have been singing "Au Large Trippers" to each trip as they leave camp, Northway has developed an unmatched style, spirit, and skill in canoe tripping. Three campers, one counsellor and two guides set off in two canoes for 2 to 10 days to explore Algonquin Park, one of the finest wilderness areas in North America. The planning of trips is always a well-guarded secret and no camper ever forgets the thrilling surprise when her trip counsellor touches her on the shoulder at breakfast and invites her on a trip that will leave that day after morning council. When trips return, campers gather to form a kick-line on the dock and sing to welcome the trippers back to camp. Each summer campers have the opportunity to assist Jim Spencer, Director of Camp Wendigo and a local canoe builder, in the restoration of a wood-canvas canoe. Girls help in all aspects of the work--bending ribs, replacing rotted wood, caning seats, and as in this picture, stretching the canvas. "The year I turned 14 my mother suggested that we think about Camp Northway for the summer. I knew that this was a place of great importance to my mother, but did not know what to expect. She was careful not to push me too hard for fear that I might build a teenage aversion to it. I loved it right away. Through the course of the nearly 10 years I was a camper and counsellor, I made some of the best friends of my life. There is something about sharing that experience, in that setting, that makes it an extraordinary place. Over the years, my desire to return has turned into a sort of annual pilgrimage to Family Camp. A few years ago, I met a man in Boston who just happened to go to Wendigo back in the 80's. He felt the same sort of connection to the place, and now my husband and I make the same pilgrimage together." "The faint breakfast call rings in my ears as I stumble to the dining hall. I smile broadly as I see pancakes sitting at each wooden table. Pancakes are my favourite. I wolf them down, drenched in maple syrup. My eyes scan the dining hall, and I realize that many girls are being asked out on trips. Their eyes dance with excitement and they shriek yes. Trees surround me, making me feel small, and roots poke up from the dirt ground. I can see the glimmering lake between the trees. A loon calls faintly in the distance. Rain patters on my tent roof, as I come back from wash dips. I peek my head outside when I am changed into clean, fresh clothes. A hazy mist slowly inches towards the lake. I pull on my rain jacket and run to play practice. I rush with excitement into the sheltered building. The rain has stopped, leaving puddles of muck everywhere, obstacles I have to dodge when I'm running to dinner. Joy floods me when I realize that dinner is pizza. After, I go back to my tent and get ready for campfire, and join the herd of girls walking to the library. A blazing fire in the corner of the wooden lodge warms it. When campfire is over, I make my way back to my tent. The thousands of stars above me glimmer and glitter against the jet-black sky. The pale moon is full and big, as it reflects perfectly on the deep blue lake, here at Northway." "When I came back to camp after 30 years to visit my daughter there, it was just the same as when I was there in the 50's: no electricity, no running water, no radios, only the sound of the wind in the trees, the water lapping on the shore, the girls laughing and calling out to each other. Because it's the same as it was, and because the world has changed so much in 35 years, this is the only thing that my daughter and I have experienced in common. It's a great blessing. "Relaxing in wildlife, swimming, canoeing, kayaking, and sailing is what we do at Northway. With about 50 campers, a good small number, I know almost everyone in camp. We have friendships that will never break. We sing in tune all the time whether it's at the table, or at the campfire. We go portaging, hiking and canoeing on trips from 2-15 (or more) days, depending on your age. On trips, we cook our own meals, and altogether have a great time. Northway Lodge is a wonderful camp. I can't wait until summer comes!"